Abstract: At low Reynolds number, locomotion is only possible through non-reciprocal body deformations and so propulsion techniques such as flapping a rigid appendage do not lead to net motion. When flexibility is introduced, fluid structure interaction and deformation acts as a natural symmetry-breaking mechanism that can yield net motion, even with reciprocal actuation. In this talk we discuss a few problems in locomotion and synchronization at low Reynolds numbers where flexibility and deformation play a key role in the dynamics of the system. Biography: Gwynn Elfring is an Assistant Professor in the Department of Mechanical Engineering and the Institute of Applied Mathematics at the University of British Columbia. His research involves modeling the fluid mechanics of soft matter systems, including cell locomotion and cellular biophysics, the mechanics of (active) suspensions, interfacial and membrane rheology, and non-Newtonian flow physics. In particular, he studies the dynamics of passive and active bodies – from bacteria to Janus particles – in complex and biological fluids. 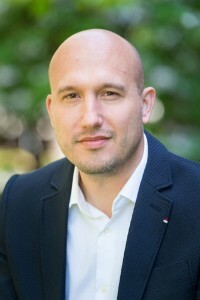 Previously, he completed a Ph.D. at the University of California San Diego under the supervision of Eric Lauga and postdoctoral studies with L. Gary Leal and Todd M. Squires at the University of California Santa Barbara before joining the faculty at UBC in 2013.